Nvidia’s Tegra graphics processor might be the current top-dog for graphics in the universe of Android devices, but Nvidia has already outlined its plans to dominate the mobile graphics arena for years to come. Last February, the company announced its forthcoming Kal-El quad-core mobile graphics chip, and now the company has provided an update on its progress, releasing a demo video of Kal-El’s real-time lighting and physics capabilities on a HoneyComb Android tablet—and all the lighting and physics are calculated in real time, rather than merely playing back canned video animations. 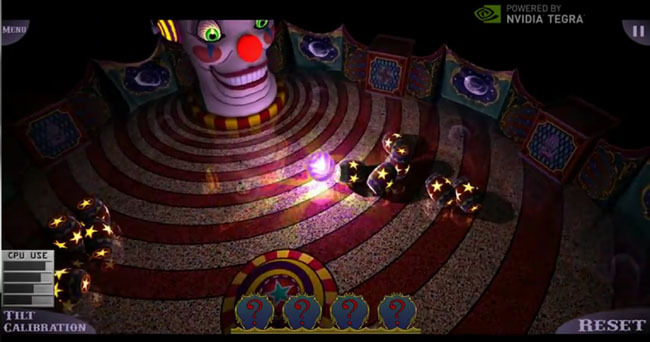 The video is called “GlowBall,” and features a glowing ball lighting up and moving through a 3D “creepy funhouse” environment. Nvidia claims Kal-El boats five times the graphics performance of the Tegra 2 processors currently powering graphics in devices like the Samsung Galaxy Tab 10.1 and Motorola Xoom. Unlike the Tegra 2, however, Kal-El boasts a quad-core processor powering the Android device, supplemented by a 12-core graphics processor. Nvidia’s video shows that the GlowBall demo is leveraging all that computing power for its real-time effects: shutting down two of the device’s main processor cores has a dramatic impact on Glowball’s overall performance. Graphics developers like Nvidia face a conundrum with mobile graphics capabilities; on one hand, they have technology from their PC businesses to put major computing and graphic processing capabilities into a wide range of devices; on the other hand, the power and heat-dissipation requirements for mobile devices impose some severe constraints: nobody is going to want to use a tablet device with fabulous graphics that’s too hot to hold and burns through is battery in half an hour. For now, graphics developers are focussing on spreading graphics duties across a number of lower-power processing cores, hoping to get more work done in each clock cycle while retaining lower power requirements. Nvidia hasn’t announced when Kal-El chips will be available for device manufacturers—emphasizing the demo was produced using a pre-production device—although industry reports have Kal-El devices hitting the market in time for the end-of-year holiday buying season. Nvidia also promises production versions of Kal-El will be significantly faster than the current demo. Kal-El is, of course, the Kryptonian name for Superman. Following on the superhero theme for its mobile processors, Nvidia has outlined mobile processors codenamed Wayne, Logan, and Stark for 2012, 2013, and 2014, respectively.